There’s slugs on my fruit trees! 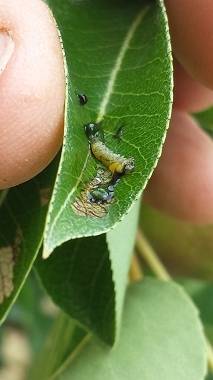 Have you seen these critters on your fruit trees? These are pear and cherry slugs, and as you can see, they eat the leaves on pear and cherry trees. The first question to ask yourself when you see these creepy looking slugs (as with all pests and diseases on our fruit trees) is, how much damage are they really doing? One of the advantages of keeping a close eye on your trees is that you will often notice problems as soon as they occur, and can then take simple action, like squashing the slugs between a folded leaf. In a normal season, this particular pest will go through at least two life cycles, so the more of them you squash as soon as you see them, the more you interfere with their natural life cycle and can prevent numbers building up. Fruit trees can actually tolerate quite a bit of damage without losing function or growth – our rule of thumb with pear and cherry slug is that if a tree has lost more than 30% of its leaves, that will be our trigger to treat them, and in all our years of growing, we’ve closely monitored every year, and never had to take action against them. 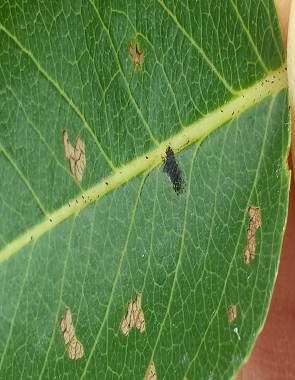 Usually what we find is that if we are patient, a predator insect will come along and do our work for us, leaving behind a dry, parasitised slug as you can see on the leaf below. 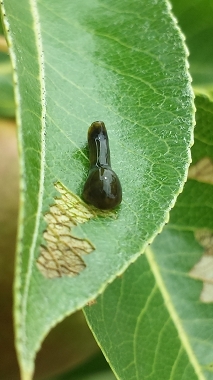 So pear and cherry slug is a great example of learning how to watch our trees and learn what’s really going on, rather than assuming that if there’s a bug, there’s a problem! If you want to find out more about the life cycle of the pear and cherry slug, and how to treat and prevent them, check out “What’s Bugging My Fruit?“. hi, I have cherry slugs each year on my pear tree and squash as I can, however, when they get really numerous I’ve found tossing handfuls of wood ash on the tree most effective as it appears to kill the slugs on contact with no harm to the tree. Thanks for your great tips and really good photos. Previous Previous post: It’s about to rain—what should I do? Next Next post: Apricot bottling and berry tarts!